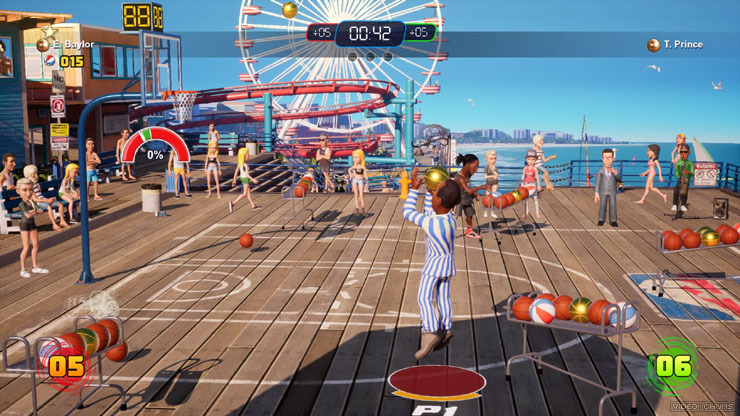 In May 2017 Saber Interactive released the arcade basketball game NBA Playgrounds on the market. With a mixed reception by the audiencethe game delivered a decent spin-off where you played with active and former stars to make spectacular moves and crazy finishers. 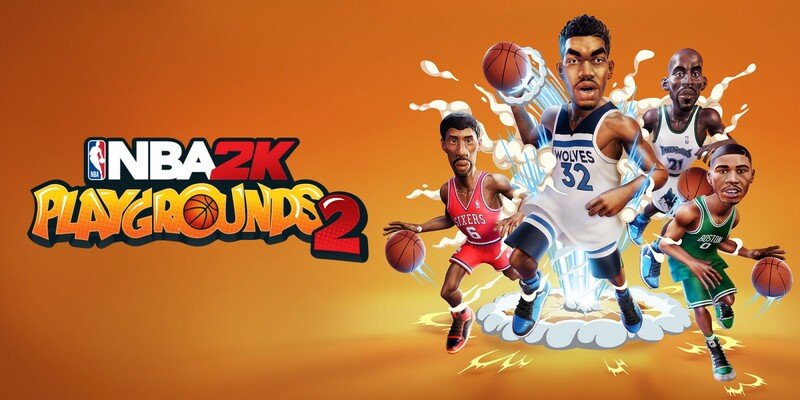 A year later 2K Sports took the license and renamed the game into NBA 2K Playgrounds 2. Saber Interactive kept the formula of its predecessor and added new content from this season to it. NBA 2K Playgrounds 2 takes the lighthearted side of the famous basketball franchise and molds it into a game. After picking your team from all existing NBA teams, you have to compete against AI or real players in two-on-two matches. By winning matches you receive coins and experience to unlock former or active NBA players. This way you can build up your own squad to become champion in the NBA season mode (offline) and King in the Playgrounds Championship (online). Besides these modes you have Exhibition and three point contest. This is all there is to the story, which means there is no real story content to explore. 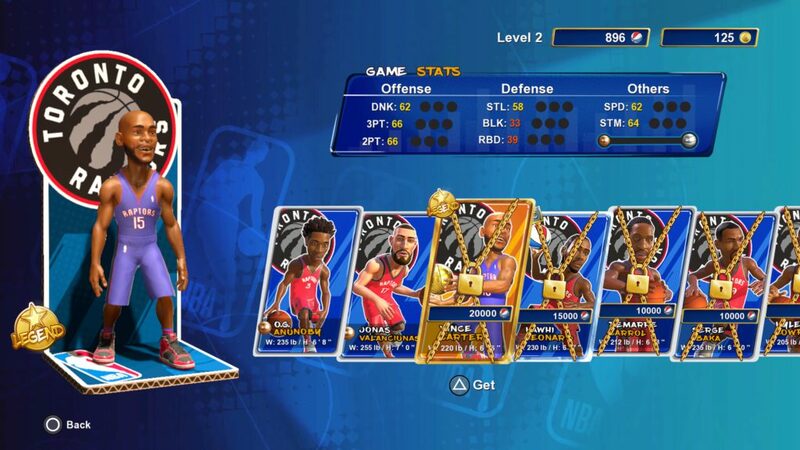 Thanks to the NBA license, most of the players look very detailed. The players are presented with smaller bodies and huge bobble heads to breach the realism part of the game. Compared to the character models, the backgrounds do need a hefty amount of polishing. The crowd doesn’t look sharp and has a limited set of animations. The locations don’t have any depth and look like a 2D portrait. The courts and buckets are decently detailed. 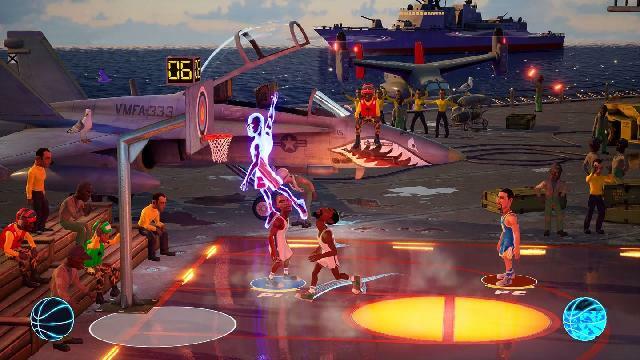 The special effects when doing insane dunks and using the given powers-ups are nicely done with stars and glowing auras around the players. The menus are basic and clean with moving icons on every tab. Overall the presentation isn’t that bad but it doesn’t have the same quality where 2K Sports is known for. Unfortunately the game lacks a good soundtrack. The menu music has a funky melody that reminds you of the local fair. First it stays in your head but it gets repetitive after a while. While navigating in the menus you’ll hear a basketball touching the ground at the background, which is nicely done. While playing your games, a commentator reports the numerous actions on the court. Also the crowd will cheer when making or missing beautiful shots and dunks, but the variation of these sounds is reduced to a minimum. Overall the different sound effects will get repetitive and boring with the fast paced games where you’ll hear the same sounds over and over again. 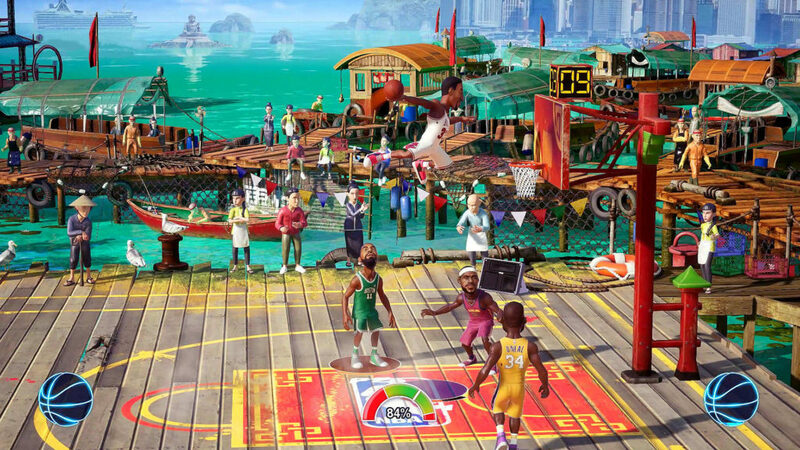 NBA 2K Playgrounds 2 is a fast paced arcade basketball game where realism is left on the background. The foundation of the former Playgrounds has been used with a decent button setup to make steals, alley-oops, insane dunks and crossover dribbles. The easy setup will give beginners the possibility to easily learn new moves, like disrupting dunks, shoving and stealing to grab the ball from the opponent and make fantastic alley-oops and half court shots. Because the action is not far away, the games are over very quickly. To keep the game interesting Saber Interactive added some intuitive features. First of all there’s now a shot meter for your dunks and shots. When you want shoot or dunk, a meter fills up and you’ll have to stop the meter in the green zone to successfully make your shot or dunk. The next new feature is the possibility to play NBA Seasons. To start a season with a team, you’ll need to unlock at least two players from that team. When you start the game for the first time you’ll be able to open three card packs to start up your first team. Don’t expect too much from these packs but you’ll need to start somewhere. In NBA Season Mode you compete with your team against the other teams to qualify for the play offs to have a chance to become the NBA Champion. Winning this title will unlock an epic card of one the better former or active players on the roster, like Michael Jordan, Scotty Pippen, LeBron James, Kobe Bryan and so on. Exhibition and a nice three point shot contest add more variety to the game modes. Then you have the online part where you can compete in the Championship and Exhibition to prove what you’re worth against a real player. While these different modes are fun, it stills feels like the game lacks a bit in varying content. Then you have the Lottery Picks. While playing with your team the special meter, that is indicated in the bottom right corner, will fill up. When the meter is filled, you’ll receive a random power-up from a total of nine different power-ups. Freezing the basket, so you can’t score for some time, double points for dunks and so on. It does add some variety to the game to break the repetition. To expand your player collection you have two options. Play a lot of games to collect enough coins to unlock the players or bypass the grind by purchasing card packs that cost real money. Your player level increases by playing games and performing nice shots and dunks. Increasing that level will result in better rewards and more coins. Sadly it will take a lot of time collecting new players. In this edition, the rosters have been increased significantly with former and active star players. Every player has his own abilities and can be upgraded from bronze to gold. Again these upgrades cost a lot of coins and experience. The last cool feature is the player customisation that can create some hilarious situations. You want to play with Stephen Curry with a chef’s hat or Lebron James with a pyjama, you can do it in NBA 2K Playgrounds 2. NBA 2K Playgrounds 2 continues where its predecessor stopped and added much more content and intuitive mechanics. Collecting cards can take some time but is rewarding when you finally get your dream team. Despite the lack of different modes and a inferior presentation the game still offers enough variety with intuitive gameplay mechanics to please the player.